A collection of 5 vintage bottles found on the former Pullman Company site, then known as the Ryerson Steel site and most recently owned by US Bank. The bottles range from c. 1900 to the 1950s. 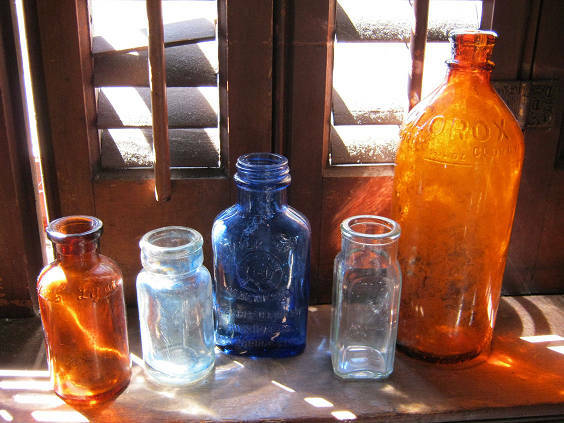 Most notable is the Cobalt Blue bottle c. 1905 and the small Amber Brown bottle c. 1900. Reference materials from the internet are in file. Description A collection of 5 vintage bottles found on the former Pullman Company site, then known as the Ryerson Steel site and most recently owned by US Bank. The bottles range from c. 1900 to the 1950s. Most notable is the Cobalt Blue bottle c. 1905 and the small Amber Brown bottle c. 1900. Reference materials from the internet are in file.